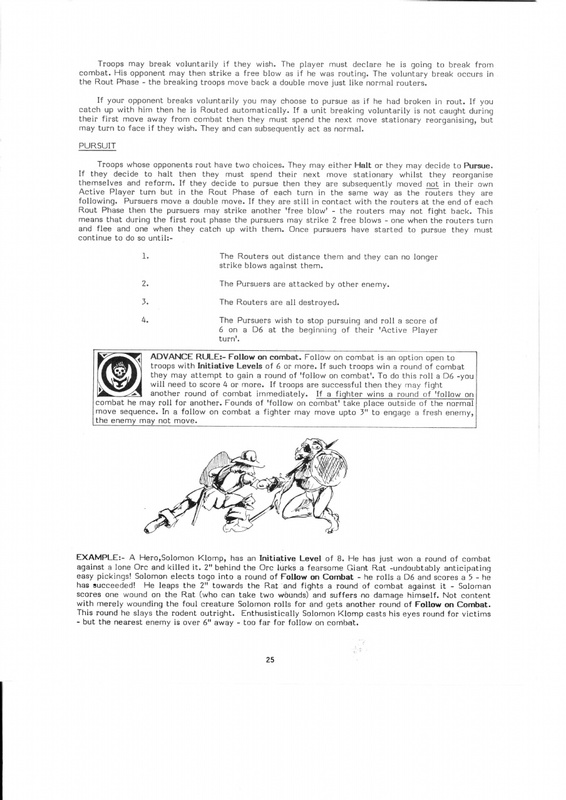 In my previous post I took my first steps into 1st edition "archeology" diving into Warhammer Volume 1: combat covering the movement and shooting phase and had a bit to say on psychology, at the time, at the front of the rulebook, rather than in the back. In Firsthammer the Mass-Combat Fantasy Roleplaying game, critical hits are handled a bit differently than in many other RPG's, for rather than being the result of a lucky die-roll, it is in fact more like a "called shot"-type of skill of any creature armed with a missile weapon provided the target is in short range and the creature has BS 4. To effect a critical hit, the shooter must hit the target and then roll as many dice to-wound as the target has actual wound points. If all of those dice rolled come up with a sufficient number for a wound (or kill as it was then called), the target has sustained a critical hit and dies instantly. otherwise the shot is wasted. I like this rule a lot, and would certainly try and use it when I finally get some mates to do some oldschool RPG-ing. After Shooting we get to the Eponymous chapter of Volume 1: Combat. Warhammer's Hand-to-hand combat system is actually my favourite hand-to-hand combat system among the games I played to date. The mechanics are table-driven but not too crunchy, opponent's skill is a big factor and armour negates damage rather than making you harder to hit or reducing damage. 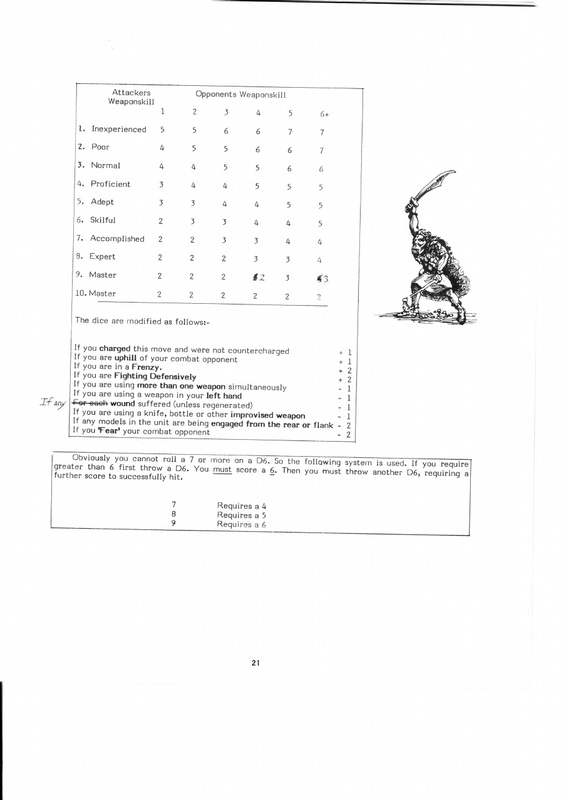 What I especially like about early editions Warhammer HTH is the fact that the chart is a lot tougher in fights with roughly equal (1 point apart at best) weapon skills. Things like higher ground, winning the previous round and charging really count in editions 1 to 3! Also, striking in initiative order, regardless of charging is Oldhammer, and as I have heard, back in 8th edition. 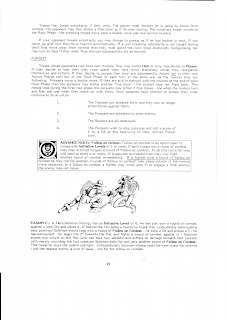 Still gone is the so-called 'stepped initiative' (a later WFRP-term) which means creatures with multiple attack do their first attack at full initiative and subsequent attacks each a grade of initiative lower, i.e: human hero with I4 and A3 would do his first attack at initiative 4, his second at initiative 3 and so forth, meaning lower initiative creatures could possibly get off an attack in between one of these attacks. Just take a look at that To-Hit chart for close combat below (and the cool dual-wielding Orc beside it). In early edition warhammer having a high WS was a matter of Life and Death! Taking a bit of a leap forward, the RPG characters you create with Volume 3 all start with but 1 (ONE) wound and in Firsthammer's character advancement system, won't get a second wound until they have earned 500 XP points (equalling 250 slain orcs or collecting 5000 Gold Crowns in loot) and you may forget about advancing strength and toughness altogether as those characteristics are not covered. You can however, advance your Weapon Skill much earlier and it would be wise to do so if you want to give your character a fighting chance against a lot of monsters. In fact, a WS 6 character may go toe to toe with a Troll, Ogre, riding reptile/riding wyvern or Mummy and have a fighting chance despite multiple high strength attacks being thrown at him just because the chance he gets hit by these WS2 or 3 creatures is quite small while he hits them easily in return. GM: "your opponent, Sir Skullsmash the Magnificent is know as an expert Swordsman!" Player: "ye gods! he has WS 8 against my 5. 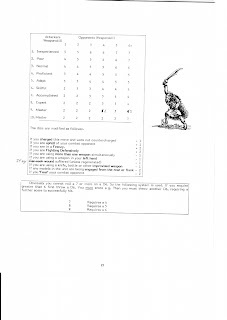 I'd better run now"
Alternatively, it can be used in lieu of OD&D's level titles for fighters "I am sir Luc de Batards, Skillful swordsman"
*overlooked this when discussing the shooting phase, but Bow Skill also had these name-grades. Next up in noticeable novelties in Firsthammer are the Weapon stats for close combat weapons. It's all quite broad categories and very much in the league of Table-top wargames rather than RPG's but a bit of a jumble at that. In all, it does make things a bit easier. just one page for the weapon rules and its pretty clear cut but would it work in the RPG-style firsthammer game? It does narrow down your choices for weapon type, your not useless with just a knife and the cheaper weapons do confer pretty bonuses in the correct circumstances. On the other hand, besides reach, there's nothing that sets a hand axe apart from a bearded battle axe, which could be a point of conflict between GM's and Axe-crazy historybuff players. To be honest, the weapon rules in Firsthammer were not doing it for me at all before I wrote this, but now I have given them more thought, they are actually rather cool and I really want to see them in action some time. But just how should creatures in RPG combat be regarded? Skirmish order or Shock order? I guess I'd have it depend on the disposition of troops, location and all circumstances that may come up in play (important because of the weapon rules). Combat results are based on number of kills per side, highest kill count wins, loser is pushed back 2" and the winner must follow. 3 pushbacks in a row cause a unit to rout, though certain creatures might rout after more or fewer pushbacks (Dwarfs for example, must be pushed back 5 times before routing, while Orcs and Goblins leg it after just 2). See that? No Break-test involved here. just plain old attrition! Free-hacks against routing backs are in this edition too, though pursuit is handled differently. 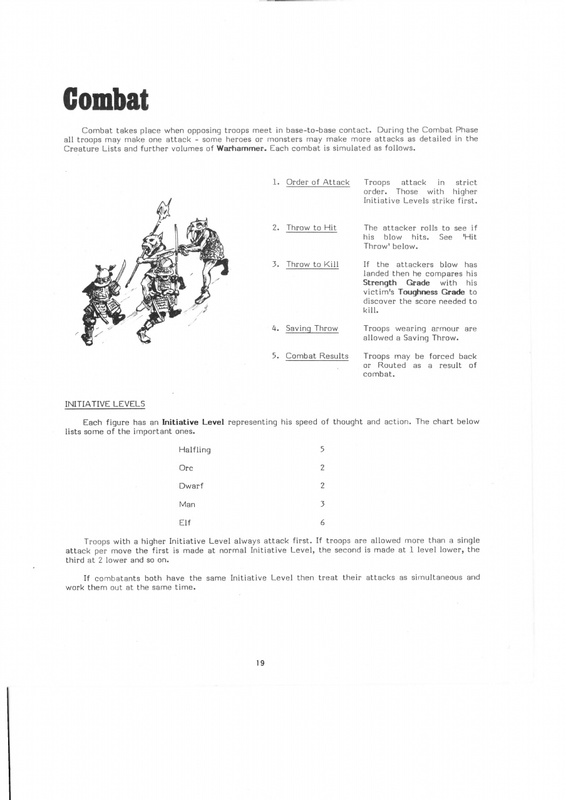 It's not completely compulsory as a player can choose to have his unit remain stationary in his next movement phase. If pursuit is given, the pursuers move in the Rout Phase just as their quarry and may strike freehacks as long as they catch up to the routers. Pursuit then only stops if the pursuers are intercepted by another enemy unit, are all killed, kill all routers or if the player controlling the unit rolls a 6 on a d6 at the start of his turn to try and stop them. And after with pursuit, as in the following of routers, follows the following Advanced Rule: Follow on Combat. This is a rule of advanced heroics thereafter only seen again in the guise of Warhammer Quest's Deathblow special rule, which is but a meagre shadow of the original. Follow on Combat is another special ability that comes for free at a certain characteristic level. In this case Initiative 6 or better. Units with initiative 6+ may, after winning a round of combat, immediately fight again if they roll 4 or better on a d6 and may move up to 3" to engage a new enemy if unengaged and may continue this as long as they win and there are enemies in range. Ah, I can just see the heroes created by my friends cut a bloody swathe through a horde of goblins as the win round after round and roll 4+ after 4+! The rule is illustrated by the first Warhammer Named Character, Solomon Klomp, who is one tough MF-er with an unthinkable (for a later edition human) Initiative of no less than 8! The basic rules end at another Advanced Rule: Knock out! providing stunning/overbearing rules for Warhammer, and the first rule which requires d10's to use (for determining the time spent out cold). Welp. That's it for today. Basic rules covered, next we fill up with some gaming tips. flavour and bestiary things form Volume 1 and I might throw in something extra just for the special.